Edgar Allan Poe is a legendary author known for both his mesmerizing horror and mystery tales and for his mysterious death. Poe was a visionary writer from the age of the American Romance period. His haunting material is still the subject of study and entertainment to this very day. 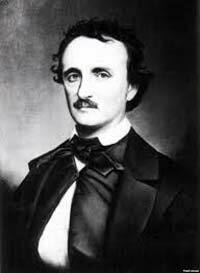 Edgar Allan Poe was born in Boston in 1809. His mother died not long after he was born and his father abandoned him in the aftermath of her passing. He was informally adopted by the Allan family of Virginia (his birth name was Poe). Poe became a student at the University of Virginia, but he left when he did not have enough funds to continue. The next step in his education was enrolling as a cadet at West Point, but this resulted in being expelled. In 1827, Poe began his writing career when he published a collection entitled Tamerlane and Other Poems. He published the work anonymously. In the following years, however, he invested a great deal of time publishing more writing. This was not of the fiction variety though. He routinely wrote literary criticism for a number of journals and newspapers. Perhaps it was during this stint as a prose writer that Poe’s ability to capture the command of the English language as well as learn what elements contribute to quality fiction. In 1833, Poe published the brilliant short story MS. Found in a Bottle and this led to him procuring an assistant editor job for the Southern Literary Messenger of Richmond, VA. Poe continued publishing scores of excellent horror tales including The Tell Tale Heart, Hop Frog, The Masque of the Red Death, The Fall of the House of Usher, and more. In 1839, a two-volume collection of his work was published. It was not, however, a huge seller. In 1845, Poe published his most famous poem – The Raven. The eeriness of this poem was far removed from what readers were familiar with during the era. With The Raven, the foundation began for the future, darker works by others wishing to capture the themes of the author. Probably the most influential work Poe published was The Murders in the Rue Morgue, a bizarre tale of a murderous ape. The great achievement of this work would be that it established many of the conventions of the detective genre. Much has been written about the death of this legendary author because it occurred under mysterious circumstances. In October of 1849, Poe was found wandering delirious in the streets of Baltimore. He was taken to a hospital where he died. All medical records and death certificates have been lost. Speculation about how he died has gone on for years. It has been assumed that he died of a drug overdose, a mugging, tuberculosis, or any other demise that fits a narrative dreamed up about him.